Huntington, W.Va. – Marshall University Joan C. Edwards School of Medicine announced today that Uma Sundaram, M.D., has been named Fellow of the American Gastroenterological Association (AGA), the nation’s oldest medical society dedicated to disorders of the gastrointestinal (GI) tract. Sundaram, a board certified gastroenterologist and vice dean of research and graduate education at the Joan C. Edwards School of Medicine, specializes in caring for patients with inflammatory bowel disease (IBD), hepatobiliary diseases and in therapeutic biliary endoscopy. An accomplished researcher, Sundaram has been awarded more than $35 million to study obesity, IBD, colon cancer, hepatitis C, and non-alcoholic steatohepatitis among other related conditions. 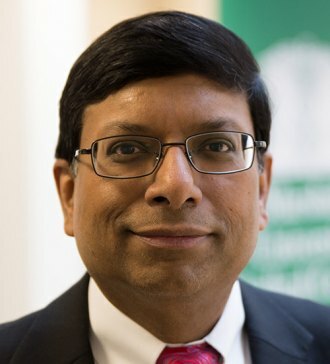 Sundaram served various roles in academic medicine at Yale University, The Ohio State University and West Virginia University before joining Marshall’s faculty in 2013. At Marshall, he is currently the principal investigator of multiple grants from the National Institutes of Health, Department of Defense Veterans Affairs, West Virginia Higher Education Policy Commission and pharmaceutical industry. “This is an incredible accomplishment for a physician and a testament to the hard work Uma has invested in growing—not just his own areas of research—but the research enterprise of our school of medicine as a whole,” said Joseph I. Shapiro, M.D., dean of the Joan C. Edwards School of Medicine. Through the fellowship program, AGA honors superior professional achievement in clinical private or academic practice and in basic or clinical research. Fellowships are awarded to AGA members whose accomplishments and contributions demonstrate personal commitment to the field of gastroenterology.